AACR · 2011, Maggiorella L. et al. 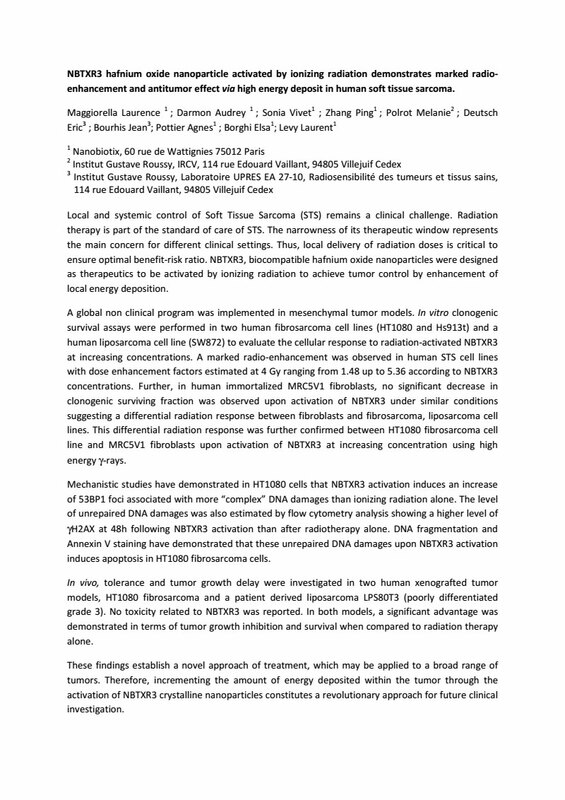 Nano Publications > Congress Abstracts > In Vitro in Vivo NBTXR3 > 2011 – AACR Abstract – NBTXR3 radioenhancement and anti-tumor effect in vitro – Magiorella et al. Content: Local and systemic control of Soft Tissue Sarcoma (STS) remains a clinical challenge. Radiation therapy is part of the standard of care of STS. The narrowness of its therapeutic window represents the main concern for different clinical settings. Thus, local delivery of radiation doses is critical to ensure optimal benefit-risk ratio. NBTXR3, biocompatible hafnium oxide nanoparticles were designed as therapeutics to be activated by ionizing radiation to achieve tumor control by enhancement of local energy deposition.